In this image, the value is the same at the end of a period as it was at the beginning ... ordinary daily activities produce what is consumed ... it is a stable steady state situation. The steady state situation is unusual. What is normal is either progress or regression. In this next case the value at the end of a periodis more than at the beginning of the period ... ordinary daily activities produce more than is consumed, and the result is an accumulation of value. In this last case the value is the less at the end of a period than at the beginning of the period ... a problem because activities produce less than are consumed. In much of the corporate world and a large part of the investment community, progress is increase in stock value of the company. The dominant measure of success is an increase in the valuation of the company normally measured by the stock price. This is good for the wealth of investors, but has dangerous implications for the rest of the socio-enviro-economic system. This definition is a very elegant definition. It is very simple, and a great contrast to the way profit usually gets defined in law and regulation … such as the FASB standards, the IASB standards, and more recently the SASB standards, where different rules can be applied in a variety of different circumstances, and in the end, there is no certainty about anything. Progress is the amount by which the VALUE at the end of the period (EOP) is more than the value at the beginning of the period (BOP) The important thing to note is that progress can be measured in this situation without needing to know anything about the activities during the period. Another advantage of this methodology is that the time interval between measurement of state can vary and be flexible and still give meaningful results, something that is very difficult when it is activity that is being used to assess progress. There has been amazing progress in technology over the last few hundred years ... the Renaissance and the period of the agricultural and industrial revolutions. Progress has been measured in money terms using financial accounting and the reporting of financial performance. Accounting systems have worked well and there has been impressive growth of financial wealth. While there has been accounting for financial wealth, other important changes have been ignored. There has been no accounting in connection with human and social capital and no accounting for the damage to and depletion of natural capital. This image was created in 2012 relatively early in the development of TVIA. The core concept remains the same, though the naming has been changed so as to conform more with other initiatives. True Value Accounting for 'Activity' is more than simply reporting on the financial revenues and financial costs of the activity as a free standing reporting entity standing alone in isolation. It is also about all of the value chains leading up to the activity and all of the post activity value chaines ... in other words a life cycle value accounting for everything involved with the activity. More on this see link. A result is different from an activity. There is progress when the 'state' improves over time. Much of the measurement of progress has been based on a money metric with a focus of financial capital and ignoring all the orher capitals. Much of progress as measured by a money metric has been achieved at the expense of other capitals which have been degraded. Thus for example: financial wealth has increased but the state of the environment has diminished. Three segments of capital: (A) Social Capital; (B) Natural Capital; and (C) Economic Capital. Intangible Capital comprises: (a) Knowledge Capital; (b) Institutional Capital; (c) Cultural Capital; and (d) Locational Capital. It does not matter very much how capital (state) is segmented or categorized ... how many capitals there are ... what matters is that ALL of capital is incorporated into the analysis. The selection of the capital segmentation referenced above is because these best seem to reflect the way the socio-enviro-economic system functions and accordingly are a good way to approach the problem of measurement of progress and performance and the design of suitable units of account. Activities produce results which may or may not result in progress. An activity that increases financial capital most likely has decreased other capitals. This may well be detrimental to society (human capital / social capital) and may bte detrimental to the environment (natural capital). An activity that results in improvement in quality of life for people (human capital / social capital) may have a negative impact on created financial capital as well as having an impact on the environment (drawing down natural capital). There are activities that go on in nature ... like ecosystem services ... that serve to remediate the environment and to establish an equilibrium within the environmental. This equilibrium has made life possible over billions of years, but recent human / industrial activities have diminished ecosystem service capacity and the resulting environmental equilibrium. TVM uses the basics of business cost accounting to get metrics about performance efficiency. The simple questions are (1) how much did it cost? and, (2) how much was done? With the answers about cost and how much done, it is possible to calculate the “unit cost” of the work done. Performance is not just an absolute metrics … it is also about how much is achieved compared to what could have been achieved. So there is a third question (3) how much should have been done with this amount of cost? This is often done in the corporate environment using “standard costs” which are the expected cost for any specific activity. Efficiency is a function of the difference between the actual costs and the standard costs. Alternatively, efficiency is the difference between what was done relative to what should have been done. Cost accounting measures performance efficiency. In TVM this is complemented with value accounting so that all the elements of socio-economic value flows are taken into consideration. Cost efficiency is the simple idea of comparing the actual cost with what the cost should have been. This is a powerful way of getting control of operational performance. How much should it have cost to do what was done? Knowing how much got done is pretty basic. Without knowing how much got done, there can be no oversight, control or accountability ... no inventory control ... no operational analysis ... in other words, without knowing how much got done, the whole process of management falls apart. With cost analysis it is possible to move on to evaluate whether or not the operations are efficient. One way of doing this is to compare what is being achieved with what should be achieved. What it should have cost is a technical question. The cost that it should be can be calculated based on what needs to be done and the prevailing processes and costs. The cost in one place can be compared to costs in other places. The cost now can be compared to costs in a prior situation. Cost efficiency is the simple idea that something should have cost X but in fact cost Y. The cost X is the cost that would be expected with a reasonably high level of performance efficiency ... usually calculated by reference to technical specifications, knowledge of the work to be done, and so on. The actual cost Y is what the accounting shows the item actually cost. A standard cost is simply what something should cost based on technical considerations and the prevailing normal prices. A well done calculation of standard cost includes norms for efficiency and what would be usual in the usual setting. In the international context different standards may be used for different countries, and used for comparative analysis. When there is a variance and costs are significantly higher than they “ought to be” there is almost always a reason. Frequently the reason is that the buyer and the seller ... people usually, but sometimes the institutions ... have some agreement that is not in the best interest of the groups that should be benefiting from the transaction. This is a common problem. A public TVM database of standard costs will help to identify situations where costs are out of control or have been distorted by inappropriate transactions. A very simple database of costs will enable comparisons to be made ... and judgments made about where costs are out of line. Too low a cost may be an indicator of a problem just as much as too high a cost. Sometimes low cost is achieved by low quality ... and this might well have serious secondary effects. Low cost (price) drugs may be because a supplier is forgoing high profits ... which is good ... or it might be because the drugs being supplied are sub-standard and maybe dangerous ... which is bad. Effectiveness is not the same as efficiency. They are two very different measures that are critical to management and oversight of performance. A society will progress best when the socio-economic activities are both efficient and effective. Performance is not just an absolute metrics … it is also about how much is achieved compared to what could have been achieved. What progress for the money? In money accounting terms cost effectiveness is progress relative to the money used. What value adding for value consumed? In value accounting terms effectiveness is progress or value adding relative to the resources consumed. Money metrics a proxy for value metrics … in many cases the money metrics are a reasonably good proxy for the value metrics … but not always. Need to measure impact, not activity. A football game … American football, that is … is won when points are scored, not merely by having the players “in motion”. The amount of “activity” is merely motion, unless the motion results in some sort of impact. A society progresses when its socio-economic activities are efficient and effective. TVM therefore incorporates cost accounting that measures performance efficiency and value accounting that is the basis of socio-economic productivity. Performance is not just an absolute metrics … it is also about how much is achieved compared to what could have been achieved. Productivity measures in the main are broad indexes of relationships between for example the revenues of an industry with the payroll of the industry. This measure suggests that productivity is increased when there is more output for less input. But this measure ignores all the value impact associated with, for example, less payroll and therefore higher unemployment and its associated value destruction. Money and material resources at the community level only benefit the beneficial owners of these resources unless other things are going on as well. The metrics of the community performance must identify not so much the ownership of money and material wealth, but whether or not the community is constrained because these things are not being used for any benefit in the community. Take the case of a bank in a community that has control over money and material resources in a community. Banks operate in and have branches located in most communities … not all communities … but many. A bank is a custodian for money wealth, and produces money profit for the owners of the bank and its senior executives and decision makers using this wealth. All of the bank's money transactions are recorded and periodically consolidated and reported on. There is no reporting of what the bank does for the community where is is located … whether the bank serves to diminish the performance of the community and quality of life or not … the only metrics are about the bank's profits! Progress is value as reflects in improved quality of life … improved social value that makes quality of life better ... netted against the depletion of natural value / the environment ... and adjusted for the degradation of the future. This is the core metric for a smart society … yet almost totally absent from the money related metrics used by the corporate community, capital markets and most of the broader society at the present time. 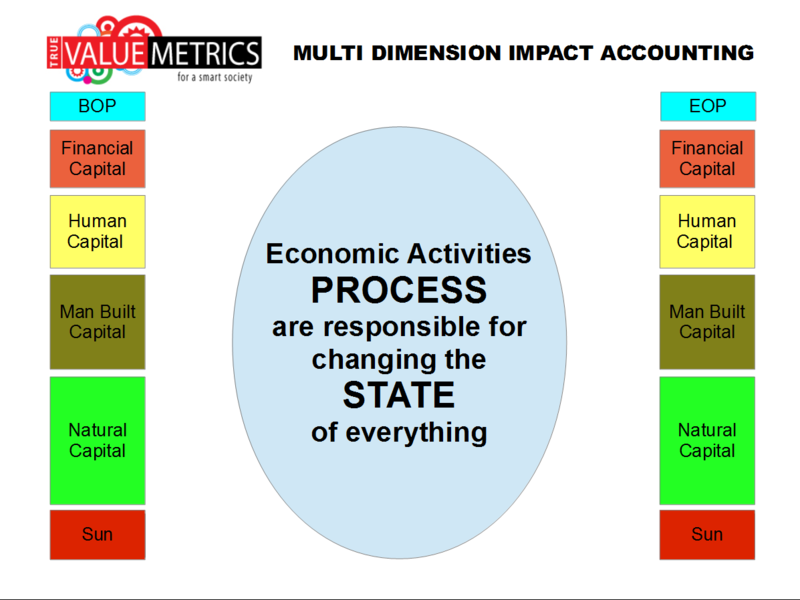 True Value Accounting does not ignore the externalities in the same way that is the practive of the conventional financial accounting profession. Rather TVIA accounts for every perspective of the system. The rules for consolidating accounts apply as all the subsidiary units doing economic activities in the community are brought into account. TVM includes transactions that reflect value as well as the normal money transactions. TVIA is more accountancy than a statistical construct. The data are as simple as possible ... the transactions as small as possible, as many as possible and as clear as possible. Some of the value of TVM derives from how TVM can do accounting for community progress. In the following graphic ... the value of the community at the beginning of the period is the same as it is at the end of the period ... the community has gone about its business for the period, the time has gone by, but nothing has changed. Data about the daily activities is not needed in the TVIA system in order to be very clear about progress ... whether it is progress or problem. All that is needed is data about the value changes that have taken place from the beginning of the period to the end of the period as shown below. Progress is about an improving quality of life … it is not merely having more profit or more growth, though these may be part of the assessment. In the TVM methodology the primary measure of progress is the value increment accruing to a society … the net of value consumed in the period and the value created during the period taking into consideration all the activities of the community. The framework for quantifying value transactions have some similarities with those of business accounting. The three key datapoints in TVIA are cost, price and value. Value is the key datapoint in measuring progress or problem. Cost is a function of and derivative of productivity and important in the analysis of activities. Price is important in money accounting and how value creation is allocated to different groups. While value is important, it is also a complex datapoint because there may be an unlimited number of views of what the unit or measure of value is for any specific element. This has been embraced for some years now by capital markets as they have created more and more complex financial instruments ... maybe not all of them proving to have substance ... but the basic idea also works for TVM value, and in the case of TVIA it has been combined also with standards also drawn from traditional corporate accounting. TVIA refers to the unit of value as the CVU ... Common Value Unit. More than anything else, however, TVIA is designed to be very practical, very simple, very low cost and very valuable. TVM considers activity as an event that consumes resources and creates outputs like goods, services and happiness. Where value creation exceeds value consumption there is value adding, otherwise value destruction. TVM treats the period value adding aspect of economic activity in the balance sheet in exactly the same way that period profit is treated in a business balance sheet. The profit of business is the net of changes in all the assets and liabilities of the business balance sheet. Similarly the value adding of economic activities changes the value balance sheet. The balance sheet concept applies at the level of the activity or of the community. The value balance sheet may be used also for organizations and for individuals or families. The most useful for the “management” and oversight of society and socio-economic performance is, however, the balance sheet of the community. When a resource is consumed in some activity, something is done. It is of interest to know what is done, but normally the objective is not to do something but to have something of value be created. Metrics about the amount of activity in relation to the resources used enables the calculation of cost efficiency … but it is the production of value that is more important and enables the calculation of cost effectiveness. Where value creation exceeds the value consumption there is value adding … otherwise there is value destruction. Value adding or destruction impacts the balance sheet … the balance sheet of the activity and the balance sheet of the community. A community balance sheet that incorporates elements of quality of life will change when value adding or value destruction activities take place in the community. It should be noted that “off balance sheet” transactions are as wrong in TVM value accounting as they are in corporate accounting. The value balance sheet for a community is affected by all socio-economic activities that relate to the community. A value balance sheet for a community that is host to large scale minerals extraction will quantify what it is losing in natural resource value compared to what the community is gaining in value such as employment and perhaps assistance with infrastructure, education, health, etc. 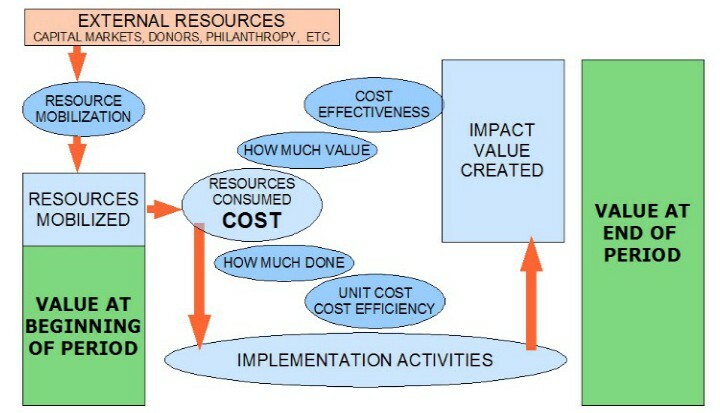 TVM value chain analysis and value accounting relative to the business organization may indicate that the profit for the organization is substantial while there is offsetting value destruction for the community. How can this be? And the answer is that business money profit accounting keeps value “off the balance sheet”! It can be argued that not having value metrics is important to the modern corporate community! There are many intangible activities that can change the value balance sheet of a community … and change it significantly and rapidly. For example, improvement in the policy framework that expands economic opportunity changes the “value” of many of the community value assets associated with people. TVM enables the dynamic of exponential change to be recorded and be a part of the accountability of decision making. Improvement in the way decisions are made about allocation of resources to value adding activities changes the value balance sheet. TVM makes explicit the relationship between tangible and intangible activities and value change even though these matters are not linear but multiple sets of complex exponential multipliers. Security changes a lot … the value of security is high based on all the economic opportunity that exists when there is compared to when there is not. People need security in order to go about their daily lives and engage in socio-economic activities. A high crime neighborhood is associated with a poor quality of life! The “value” of a person is diminished when there are no job opportunities where a person may used their skills. A place may have people and resources but nothing gets done and there is no progress. This is because there is no capacity for organization. Putting in place an framework of organization adds value to the community and enables resources to be used effectively to create the value for progress. Stats on the Game … But What Game? The game is better and better quality of life … and the metrics of performance should have a focus on this. Better and better quality of life is the way this game needs to be scored, and the way the game is played. The “stats” should be all in support of this game. This is about social value as well as about business profit … it is about values in society as well as money and material wealth. More and more and more is NOT the game! The dominant performance metrics are all about money and profit and economic growth based on more and more and more economic consumption. The end game for this system of metrics is a planet that no longer works to support humanity … but will appear “profitable” until it is “too late”. More and more growth is the prevailing metric! This is a dangerous situation … consumption growth and profits are the top metrics and a path that will ultimately … and maybe quite soon end up with global value destruction on an unimaginable scale. The main metrics for global economic performance are large aggregates and averages about growth and capital market performance. These metrics have some importance in aggregate, but do not inform decision makers adequately. The measures used for global economic performance are interesting, but not very useful. They have connection with correlation … but do little or nothing to help with cause and effect and with making better decisions. TVM aims to change the mindset that economic performance is about more and more but is better when it is about improved quality of life for society. Paradigm change ... Not only a bigger pie … a better pie! TVM is aiming for some paradigm change. In the TVM view, global economic performance is the aggregation of socio-economic performance in the individual communities. Progress and performance is a result of tangible activities at the community level … done by real people who understand the cause and effect of actions in their locality. The history of economic performance has a lot to do with technology and productivity … and much less with issues like monetary and fiscal policy. Technology and productivity are the “changemakers” that enable the creation of wealth, while monetary and fiscal policy, and the framework of law merely reposition wealth among various constituencies in society. The prevailing metrics suggest that the global economy has done very well when viewed from the luxury of society at the top of the socio-economic pyramid … but the performance of the global economy from the perspective of more than 4 billion people who are poor and hungry, the socio-economic performance is pathetic. There are chronic problems with the socio-economic system and especially decision making and the allocation of resources and the accountability for resource use … and the prevailing system of metrics does little or nothing to help. The singular incentive of money, power and profit has created a monster that is difficult to tame … but not impossible. Metrics are very powerful … but the metrics need to be about all the important things and not only about the money profit subset of metrics. There also need to be metrics about important social value matters, even though these are more difficult to quantify. The way the modern socio-economic systems works is not merely inefficient, it is substantively dysfunctional. It does not have the capability to allocate resources to satisfy the real needs of billions of people, but puts resources into “creating” artificial need for people who already have more than enough for their well-being. The driving force of modern market economics and capitalism has been the simple idea that the pursuit of wealth is the best incentive for people to be fully engaged in activities that produce progress. There is no question that an economy based on this premise is better than one driven by egalitarian sharing of the product of enterprise … as in socialism or communism … but that does not mean that the capitalist market system works very well and is the best that can be devised. Without an alternative measure of performance the capitalist market system is going to be “the best there is” … but, based on true value metrics it is abundantly clear that something better is possible. Building wealth by the exploitation of the poor is as old as history. There is nothing wrong with the creation of wealth … but there is a lot wrong when there is little progress out of poverty because it is the price being paid for the accumulation of wealth and its concentration in the corporate sector and among powerful individuals in the economic elite. Concentration of economic power was seen as detrimental to society in the era of the “robber barons”, and the basic logic of the argument has not changed at all over the years. Money profit and value performance not the same … they are very different. The economic elite and major decision makers have become comfortable with profit measures that ignore all the value destruction in society that enables profit making at its maximum. The profit money accounting metrics are convenient … but fundamentally wrong. Activity and impact are different as well … though many people doing academic studies and carrying out ORDA funded projects report mainly about the activities they have done rather than any impact these impact that may have been realized! Winning the Game! What Game? If that isn't insane, I don't know what is! the Environment being remediated and made sustainable. More and more … of what? So much of modern progress has merely been doing more and more of what, arguable, the world neither wants or needs. A huge effort has been expended in trying to create wants and needs … for no good reason. The world has achieved an amazing capacity to produce … something never achieved before at any time in human history, but the metrics about socio-economics are pushing for production of all the wrong things … for things that produce profit and rarely if at all those things that would satisfy needs … be valuable, without being profitable. The prevailing metrics are wrong most of the time, something that is terribly dangerous for the future of humankind andf the planet. In the money metrics construct winning is more and more of money and material goods … with quality of life assumed to improve with more and more of these things. In sports, scorekeepers keep score and the score tells which team it is that wins. Society is similar … with the present money metrics system of scoring, winning is about more and more money. In a value based society winning will be maximizing quality of life … the values that make life worth living. TVM/TVIA thinks of progress towards maximizing quality of life as winning the game. This is not a money construct but a value construct and way more complete as a system of metrics than mere money and money accounting that has changed rather little since it was devised in its modern form some 400 years ago. In TVIA, progress … maximizing the quality of life … has a central role, just as profit has had a central role in the business entity and the money metrics of capital markets.